In case you haven't noticed I've become a bit of a food hound lately. I mean for goodness sakes I just posted about Peanut Butter Bacon Cookies. Clearly an intervention is needed. 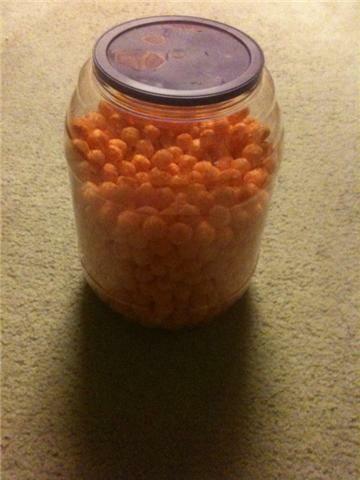 I am now the proud owner of 35 oz's of Cheese Balls. 2.) Now that Jack is crawling and cruising all over the place I grab what I can. And lets face it...cheese balls and other assorted crap foods are much easier to grab in a pinch. 3.) The Hubs and I have seemingly opposite schedules and I HATE cooking just for myself. And even when it is the 2 of us, it seems so hard lately to find the time or motivation to make any meal-much less a healthy one. I know. Waha. Waha. Maybe it's just the yucky feeling in my tummy right now from eating cheese balls and a coke at 1 am or maybe it was catching a glance at my bloated tummy in the mirror, but I feel like I need to get back on track, at least a little bit, and soon. I need to come up with some sort of plan. We use to by the big cheese ball containers - our lab loved them When she saw the container come in the house she was all excited! I read your post and had to laugh! It sounded so familiar! Not worrying about loosing weight because of impending, (or so I hoped!) pregnancy, eating in a rush, and junk food in the middle of the night! Sounds like my life, past and present! (except for the pregnancy thing!) Good luck! I'm visiting with sew can do, I'd love it if you visited me too! By the way, your little one is adorable!